In addition to curating the BOOKSHELVES installation, my new works are available for reading and listening at 3307 W Washington Blvd. Inspired by the early morning singing and the staccato nursing schedule of my daughter, I composed a multi-sensory installation that considers the development of voice literally and figuratively. In addition to my shelving arrangement and titles on loan, my new text piece, Time Scroll, and sound installation, Song Waves, are currently on view. This Spring we tested another iteration of Public/Social Practice Market Lab with support from the Otis Graduate Public Practice Program (GPP). 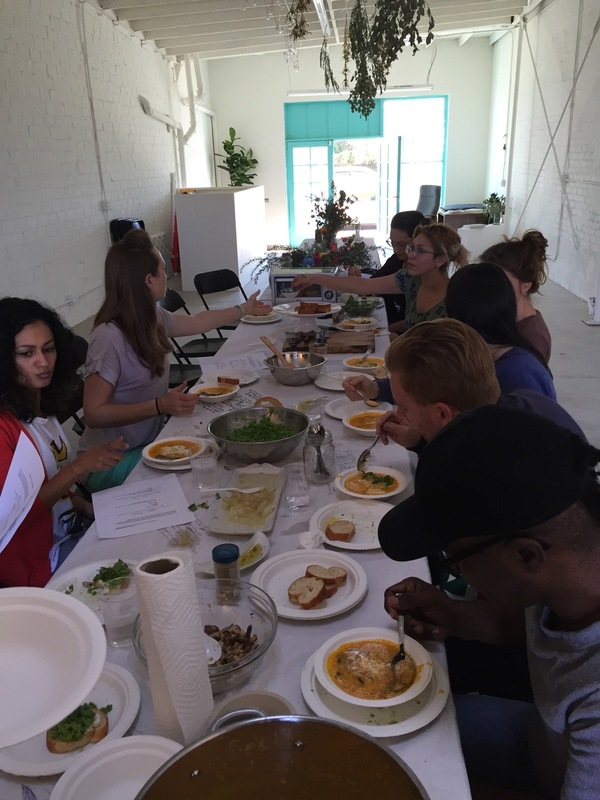 This session, facilitated by visiting lecturers Amanda Katz and Tamarind Rossetti in collaboration with first and second year graduate students and faculty Sara Daleiden, explored the three-tiered process of preparing, eating, and cleaning after a meal in accordance with the market lab discussion of host-guest relationships, collaborative social practices, and self-care as an integral element of artistic practice. On February 20th, 2016, the LA Great Streets Connect the Dots team worked with the people of Van Nuys to transform Van Nuys Blvd. into a water-wise, bike friendly, interactive city street. And after dark, The Beginning of Water three-channel video installation lit up the promenade for pedestrians and motorists to enjoy throughout the evening. Days in Venice looking. After spending time, certain items came into focus, based on experience in this home and this town.